A political appointee without any apparent background in conservation work is running a state water quality restoration fund, a departure from statutory requirements of the job. Bryan Gossage, of Apex, became the executive director of the Clean Water Management Trust Fund on Nov. 4, and will make $78,000 a year in that position, according to Drew Elliot, the communications director for the N.C. Department of Environment and Natural Resources. 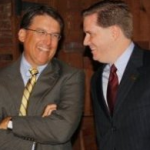 Bryan Gossage, right, with Gov. McCrory. Source: Gossage’s LinkedIn page. It is Gossage’s second job in the McCrory Administration in the last six months, and a significant drop in pay for the former Apex councilman. He was initially hired in May, at a $117,000 annual salary, to serve as a deputy secretary in charge of innovation support at the N.C. Commerce Department. His wife, Chloe Gossage, is McCrory’s policy director and earns $110,000 a year advising the governor. Bryan Gossage did not return a phone message seeking comment left Monday afternoon at his DENR office. In his new position, Gossage is tasked with overseeing the state’s purchases and management of conservation lands along waterways that are intended to maintain or improve water quality. The trust fund, established in 1996, was an independent agency until this summer’s legislative session when it was brought under DENR and expanded to include the National Heritage Trust Fund, which sought to preserve natural areas that are ecologically diverse or have cultural significance. The Clean Water Management Trust Fund position has typically been filled by those with extensive backgrounds in conservation or environmental work. Gossage’s predecessor Richard Rogers led the trust fund from 2007 until August, and had worked before that in various positions at DENR since the mid-1990s. Gossage, however, does not appear to have that background, and doesn’t list any experience in environmental or conservation work on his LinkedIn profile, an online networking website. Before arriving at the Commerce Department in May, Gossage owned and operated his own small communications companies, a marketing and public relations firm called Peak Media Group, Inc, and Hadleigh Media Co., a platform for digital news websites. He also served on the Apex Town Council from 2003 to 2011 and had an unsuccessful run as a Republican candidate for the state legislature in 2008. In 2005, he was listed as a plaintiff in litigation challenging the state’s use of millions in incentives to entice Dell, Inc., to open up a computer manufacturing plant in Winston-Salem. Dell closed the plant in 2009. “if we hear back”, I for one won’t hold my breath waiting to hear on a response. I used to think it was just the ‘other’ southern states that were jam packed with corruption, I guess I now need to place NC in that very same category. The Grand Wizard ran on supposedly ending corruption, yet every action his admin has taken reeks of it. Voters need to take note. I think the obvious reason for this appointment is stated in the article – “His wife, Chloe Gossage, is McCrory’s policy director…”. They can’t seem to find a place for this guy – first they tried to put him in a deputy secretary position at the Department of Commerce, another position for which he was unqualified and now they are sticking him in DENR. McCrory stated that “seat warmers must be a thing of the past”, but this guy is clearly nothing but a seat warmer in an obvious case of cronyism. As the previous comment states – Voters need to take note.